I will draw cartoons on any subject a client can think of ... as long as as it's legal and they are willing to pay me the appropriate fee for it. It's all part of the "cartoonist for hire" side of the job. 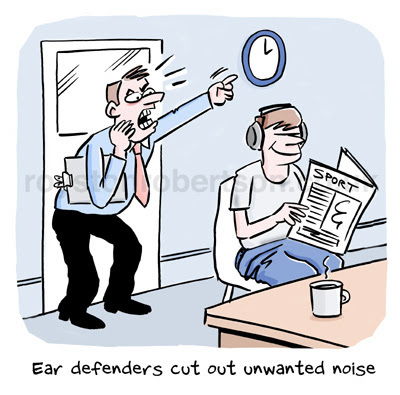 Above is a cartoon for a car-trade magazine. Below is an excerpt from a strip for a finance company's intranet (click to read). Recently I was asked to come up with six cartoons on the subject of "anaerobic digestion". That, as I'm sure you know, is the process of turning waste products into bio-fuels. I've asked around, and no cartoonist I know has so far come up with anything more odd as a commission! Clearly, it's not an obvious subject for humour, but it can be done (and was). The key is not to get bogged down in jargon and detail. The cartoon should be quick and simple, a humorous counterpoint to the serious stuff. And it can be very serious: the above is from a book called The Business Impact of Enterprise Asset Management. Here's a random selection of some other subjects I've been commissioned to draw cartoons about over the years: planning regulations, the Lord Mayor's Show, NHS governing boards, accountancy, tourist guiding, the London Local Authorities Act, curry (and rice), health and safety, life in medieval times, careers, grammar and punctuation, golf, caravanning, IT marketing ... I think you probably get the point. Good stuff. 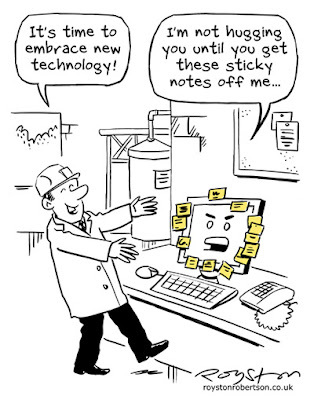 Really like the yellow post it notes - they really pop out in the cartoon. Thanks, Tim. Actually, all the illos in that book were black and white ... I added the yellow for this blog post!